Don't use Imageshack or Photobucket. Don't post paint requests. Last edited by Kyle Schurb on 12 Jan 2013, 01:38, edited 12 times in total. For me the bowling shoe is one of the most beautiful and interesting liveries ever. It was a tough design and very unique! Much better than the silver look afterwards. Very goooood job Kyle - you are really one of the best painters here! Stunning work Kyle, looking forward to this one! Post updated with an FS shot. 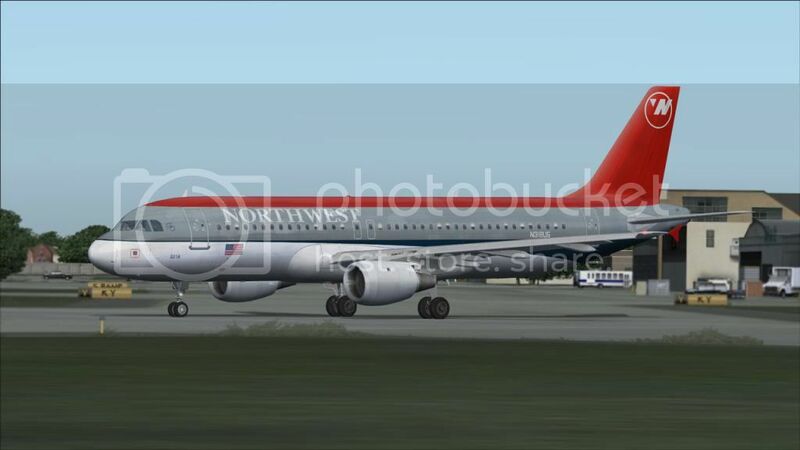 Didn't do anything new to the paint itself, it just now includes stolen tail, winglets and engines from my NW A319 paint I released a long, long time ago (available at Avsim). This paint likely won't be as good as I was at my peak back then, but we'll see. I will of course update those items to match the A320 livery. I'm rather impatient and wanted this in FS right away to see how it looks. Edit first reply, showing new cropped cutouts from the paint kit template. Not finished yet by any means but I'll stop here for today. First image works best if you right click it and click "View Full Size" or something to that effect. The first image is sharpened a notch just to bring out some details; I likely won't sharpen it for the actual paint/bitmap. I had a weird feeling you'd do this paint. I might continue work on the NC though. Edited first post with a new shot in the simulator. Not happy with the registration font, the red doesn't bend up to the trailing edge of the tail perfectly yet, and a whole slew of other things. Haven't touched the engines yet or the tail from A319, etc. I also edited the shot way too much, something I didn't even want to do to begin with but it just happened. First post updated with a new shot from the sim. I managed to make the red to trailing edge of the tail worse. Special no-frills shot for you! Last edited by Kyle Schurb on 15 Dec 2011, 01:08, edited 1 time in total. First post edited with a new pic. Still working away at it. (Unedited shot) Right side now complete, still working on engines, tail, belly. Very very nice paint!! Cannot wait to get my new rig so I can run it on fsx smoothly..
Added a pic of the right side to the first post. Will probably tone down the saturation of the blue a bit. First post updated, sorry to keep "Bumping" the topic - thought I was done a few hours ago but found some more time to work on it. Some details added to the engines. I noticed your work in the water cooler earlier today, and I started to wonder what happened with this paint. I was really looking forward to it. Guess I just forgot about it - I'll finish it up soon, when I can. Certainly is nice work Kyle for someone who hasn't painted in a while! Well, it finally happened, I decided to fix what I wanted to (or at least as much as I was willing to put in) with the tail and belly alignment and some other things, and it's done after only 13 months. Not sure I really like it, looking back I think I tried too hard or something. Oh well.